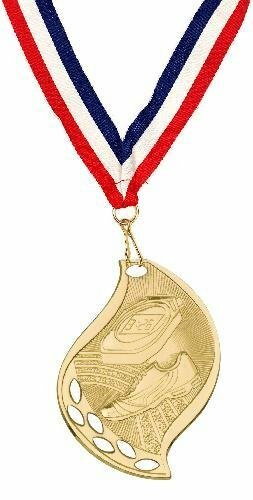 2-1/4" gold Swimming medallion with neck ribbon. Custom engraved on the back with your specified text, up to 5 lines, with a maximum of 16 characters per line. Add to cart to customize with your engraving. 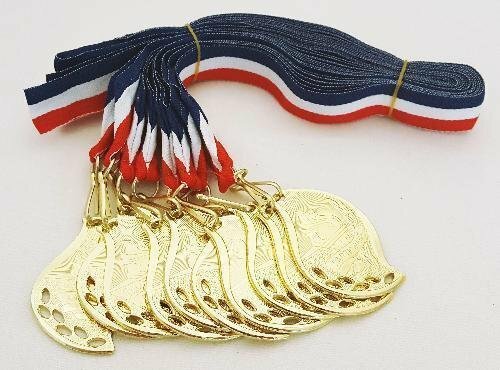 A setup charge applies to each order of medals, not per medal. 2-1/4" gold Tennis medallion with neck ribbon. Custom engraved on the back with your specified text, up to 5 lines, with a maximum of 16 characters per line. Add to cart to customize with your engraving. A setup charge applies to each order of medals, not per medal. 2-1/4" gold Track medallion with neck ribbon. 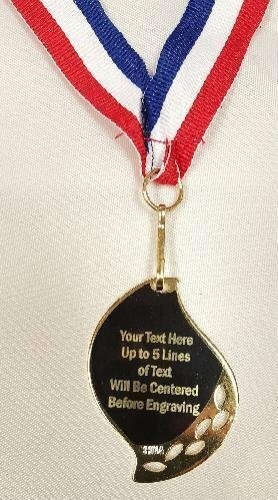 Custom engraved on the back with your specified text, up to 5 lines, with a maximum of 16 characters per line. Add to cart to customize with your engraving. A setup charge applies to each order of medals, not per medal. 2-1/4" gold Victory Cup medallion with neck ribbon. Custom engraved on the back with your specified text, up to 5 lines, with a maximum of 16 characters per line. Add to cart to customize with your engraving. A setup charge applies to each order of medals, not per medal. 2-1/4" gold Victory medallion with neck ribbon. Custom engraved on the back with your specified text, up to 5 lines, with a maximum of 16 characters per line. Add to cart to customize with your engraving. A setup charge applies to each order of medals, not per medal. 2-1/4" gold Volleyball medallion with neck ribbon. Custom engraved on the back with your specified text, up to 5 lines, with a maximum of 16 characters per line. Add to cart to customize with your engraving. A setup charge applies to each order of medals, not per medal. 2-1/4" gold Wrestling medallion with neck ribbon. Custom engraved on the back with your specified text, up to 5 lines, with a maximum of 16 characters per line. Add to cart to customize with your engraving. 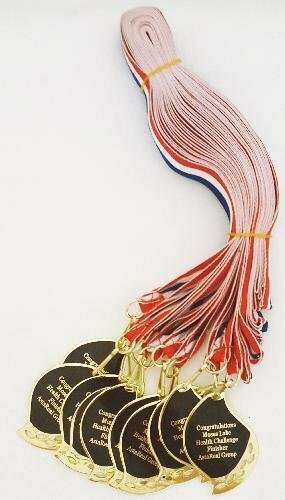 A setup charge applies to each order of medals, not per medal. 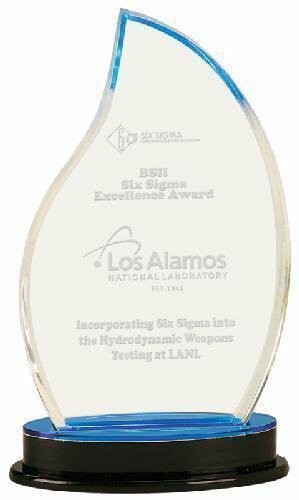 The facets along the edges of this graceful flame design reflect the color from the top of the base up through the clear acrylic, creating highlights in this stylish award design. The black acrylic base provides a sturdy and elegant foundation for the large personalization area.